Canada is presenting its Voluntary National Review (VNR) on progress toward the 2030 Agenda and its attendant 17 Sustainable Development Goals (SDGs) this year at the UN High-Level Political Forum (HLPF). In order to provide a fuller picture of sustainable development in Canada – one that takes into account our country’s geographic and demographic diversity – BCCIC presents Where Canada Stands, Vol. II, a shadow report to Canada’s official VNR. Building on Where Canada Stands, Vol. 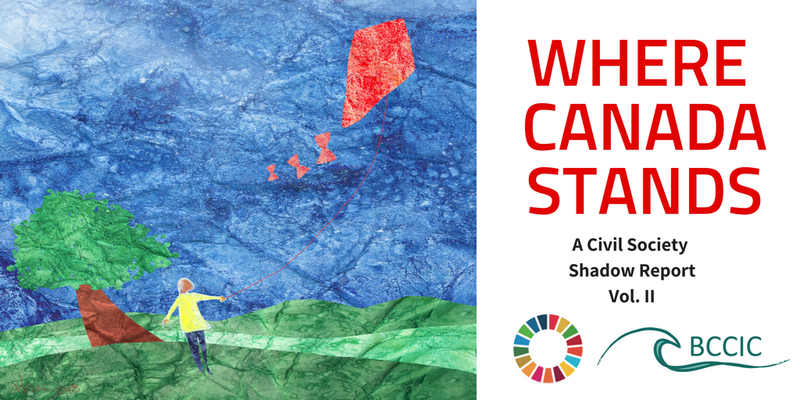 I – last year’s civil society assessment of Canada’s progress on the SDGs – this report assesses SDG implementation in Canada through the guiding question: “who is getting left behind?” For each SDG under review this year, both the national and sub-national contexts were considered through regional analysis and the presentation of case studies. Experts interviewed in these areas represent Indigenous communities, universities, think tanks, NGOs, CSOs, youth, industry, and various levels of government. The case studies were selected to represent a diversity of regions, and to highlight success stories where targets were met and no one was left behind.